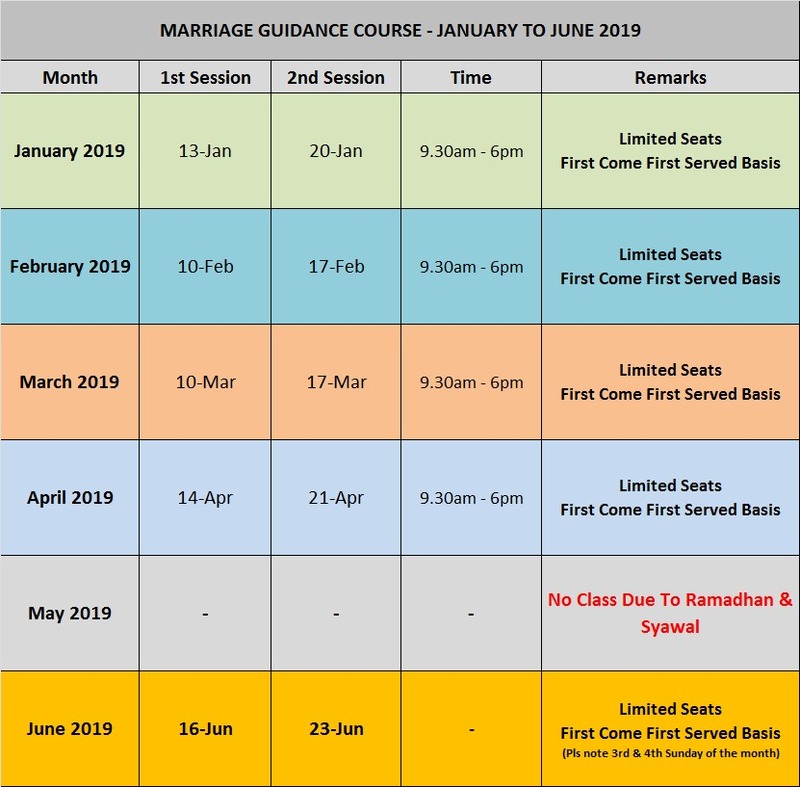 Darul Arqam offers Marriage Guidance Courses for those intending to get married, as well as short courses that are conducted seasonally with topics that cover current and contemporary issues. Conducted in English over 2 Sundays. Useful for converts as it tackles issues arising from different cultural backgrounds. Tea break and lunch will be provided. Participants will receive a certificate at the end of the course. Please proceed with the Application ID Number to the English Islamic Bookshop located at Level 1 of our building for payment. Seats are confirmed upon payment. Please note that no payment will be accepted once the class is full. Attendance for the whole course is compulsory. Attendance will be taken before the commencement of each session and again at the end before session is dismissed. Registered participants who wish to withdraw*/postpone from the course are required to email the Education Division at education@darul-arqam.org.sg no later than 3 working days from the day of the course. Withdrawals or postponements done less than 3 working days from the date of course are considered as last-minute withdrawals/postponement. The organizer shall not REFUND the course fee to any participant who has failed to inform the Education Division within the time frame. Request for rescheduling for such last-minute withdrawals will NOT be entertained. 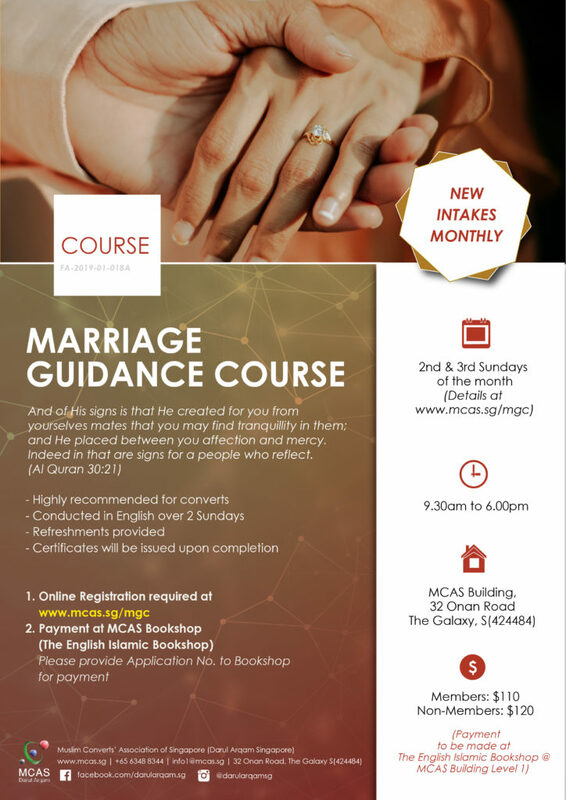 Participants who wish to schedule for another session will have to RE-REGISTER for the Marriage Course at the prevailing Course Fee subjected to availability of slots. The minimum number of students to run this course is 12 participants. Participants will be informed 1 week prior to commencement date if the course needs to be cancelled /postponed due to this quota not being met. Participants may choose to either withdraw or attend the course on the next available dates. Participants are requested to be PUNCTUAL for all sessions. The course will commence at 9.30 am sharp. Participants, who are more than 15 minutes late for any session or failed to attend all the sessions, will be considered as having withdrawn from the course. Such cases will be treated as last-minute withdrawals; with the terms of Withdrawal/Postponement above applied. A certificate of attendance will only be issued upon completion of attending all sessions. Please check the spelling of your name and NRIC or passport number when reporting for your attendance. Please advise Education Division staff if there are any errors, before the printing of your course certificates. Registrants must be at least 21 years of age when registering for this course. Breakfast and Afternoon Tea will be provided. Participants must complete the feedback form after each topic and submit to the respective speaker. An Overall feedback form needs to be completed on the last session and submitted to the coordinator at the end of the day. WE WOULD APPRECIATE IF PARTICIPANTS COULD TAKE SOME TIME TO FILL UP THE FEEDBACK FORM. YOUR FEEDBACK IS VERY VALUABLE TO US IN ORDER TO SERVE YOU BETTER. THANK YOU.